Is Mosaic the right tool for me? A url alias is an additional custom url for an item. This can be used to add an alternative url to link to a page, or to simplify a URL and/or make it more user-friendly e.g. www.mymosaicsite.ox.ac.uk/events/marketing/marketingevent1 could be given an alias of www.mymosaicsite.ox.ac.uk/customname. More than one alias can be defined for a page. A specific page can be redirected to a different specific page on a different site e.g. /holinshed to http://english.nsms.ox.ac.uk/holinshed. Simply define the source (omitting the Mosaic domain name) and the full URL of the destination. If you need to redirect a page to another URL within your Mosaic site, then use an 'alias'. See above section. Note that 404 responses are cached by the web server for 15 minutes, so if you add a new redirect it may take up to 15 minutes before that redirect takes effect. In addition to individual redirects, you can create rules that apply to many pages. Redirects can be used within your Mosaic site, or to a 3rd party site. The above example is for redirection within a Mosaic site, but this can also be used for redirecting to a 3rd party site e.g. /learningzone/insects/page1 to http://www.oum.ox.ac.uk/thezone/page1. This section provides details of which pages have been requrested by users, but do not exist on the site. You should define url aliases for the most frequently requested urls so the user can be sent to an appropriate page instead of seeing the missing page (404) message. 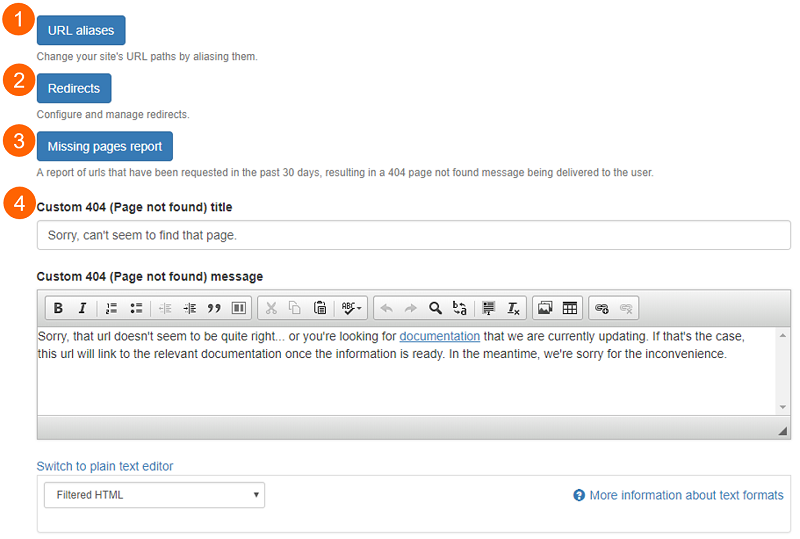 If the user links to a page that does not exist on your site, then they will see the site's 404 message. You can customise this in this section.